We have released V2.2 of Vibracart Paypal. As well as bug fixes, tweaks and some tidying up of the cart cosmetically this version has a number of new features. Vibracart can now work with Buy Now buttons and Paypal payment links as well as Add to Cart buttons. Vibracart now has three ways to handle item discounts. Discounts are applied to the item price. So if three $3.00 items are purchased and a 10% discount is applied the discount is shown like this in the cart. This is the default method and the same as used in previous version of Vibracart. Mode 2 will combine all discounts which are displayed as a total in the cart. The item price is left as it is. So for example if the user purchases three $3 items and a 10% discount is applied then it will leave the item price at $3 but add the $0.90 discount to the total discounts like this. 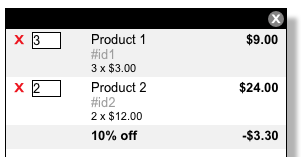 Mode 3 will display the related discount for each product in the cart. The unit price is left as it is but the item total will include the discount. So for example if the user purchases three $3 items and a 10% discount is applied then it will show the item price at $3 and show the $0.90 discount. The item total will show $8.10 like this. Discounts and coupons can now have descriptions (labels) applied which are displayed in the cart. Here is an example of a cart wide discount. This can be used to offer unit pricing that changes depending on the quantity purchased. Unlike $itemqtydiscountpercent which adjusts the price of all items based on the quantity $stepqtydiscountpercent allows you to, for example, charge one price for the first one purchased, another price for the next 5 purchased and a third price for the following 5 etc. We have added a chapter to the manual which explains how you can have discounts applied for logged in Sitelok users. Discounts can be applied based on whether a user is logged in, based on usergroup membership or even for specific users. Vibracart can also force users to login before checkout to ensure any applicable discounts are applied before payment.